This article was first published by Global Research on November 08, 2010. Private military and security companies (PMSC) are the modern reincarnation of a long lineage of private providers of physical force: corsairs, privateers and mercenaries. Mercenaries, which had practically disappeared during the XIXth and XXth centuries, reappeared in the 1960’s during the decolonization period operating mainly in Africa and Asia. Under the United Nations a convention was adopted which outlaws and criminalizes their activities. Additional Protocol I of the Geneva Conventions also contains a definition of mercenary. These non-state entities of the XXIst century operate in extremely blurred situations where the frontiers are difficult to separate. The new security industry of private companies moves large quantities of weapons and military equipment. It provides services for military operations recruiting former militaries as civilians to carry out passive or defensive security. However, these individuals cannot be considered as civilians, given that they often carry and use weapons, interrogate prisoners, load bombs, drive military trucks and fulfill other essential military functions. Those who are armed can easily switch from a passive/defensive to an active/offensive role and can commit human rights violations and even destabilize governments. They cannot be considered soldiers or supporting militias under international humanitarian law either, since they are not part of the army or in the chain of command, and often belong to a large number of different nationalities. PMSC personnel cannot usually be considered to be mercenaries for the definition of mercenaries as stipulated in the international conventions dealing with this issue does not generally apply to the personnel of PMSCs which are legally operating in foreign countries under contracts of legally registered companies. Private military and security companies operate in a legal vacuum: they pose a threat to civilians and to international human rights law. The UN Human Rights Council has entrusted the UN Working Group on the use of mercenaries, principally, with the mandate: “To monitor and study the effects of the activities of private companies offering military assistance, consultancy and security services on the international market on the enjoyment of human Rights (…) and to prepare draft international basic principles that encourage respect for human rights on the part of those companies in their activities”. During the past five years, the Working Group has been studying emerging issues, manifestations and trends regarding private military and security companies. In our reports we have informed the Human Rights Council and the General Assembly about these issues. Of particular importance are the reports of the Working Group to the last session of the Human Rights Council, held in September 2010, on the Mission to the United States of America (20 July to 3 August 2009), Document A/HRC/15/25/Add.3; on the Mission to Afghanistan (4-9 April 2009), Document A/HRC/15/25/Add.2, and the general report of the Working Group containing the Draft of a possible Convention on Private Military and Security Companies (PMSCs) for consideration and action by the Human Rights Council, Document A/HRC/15/25. In the course of our research, since 2006, we have collected ample information which indicate the negative impact of the activities of “private contractors”, “private soldiers” or “guns for hire”, whatever denomination we may choose to name the individuals employed by private military and security companies as civilians but in general heavily armed. In the cluster of human rights violations allegedly perpetrated by employees of these companies, which the Working Group has examined one can find: summary executions, acts of torture, cases of arbitrary detention; of trafficking of persons; serious health damages caused by their activities; as well as attempts against the right of self-determination. It also appears that PMSCs, in their search for profit, neglect security and do not provide their employees with their basic rights, and often put their staff in situations of danger and vulnerability. 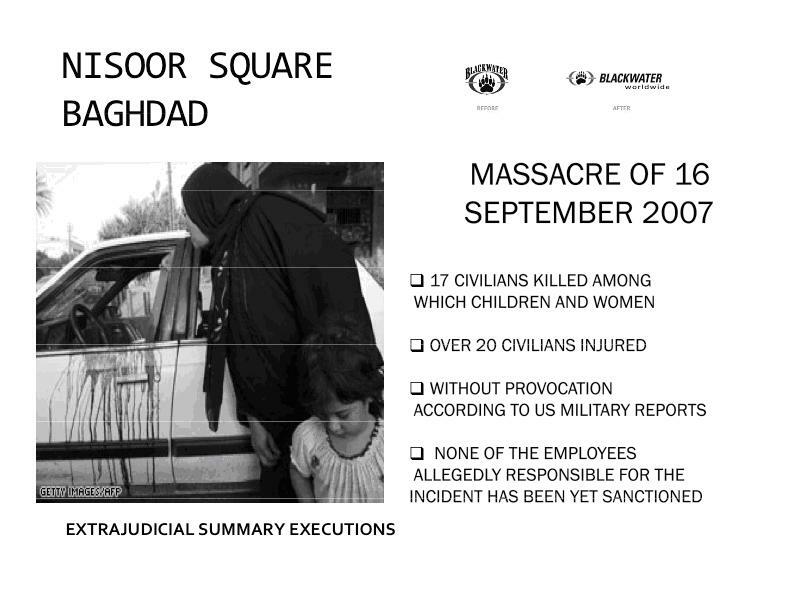 On 16 September 2007 in Baghdad, employees of the US-based firm Blackwater were involved in a shooting incident in Nisoor Square in which 17 civilians were killed and more than 20 other persons were wounded including women and children. Local eyewitness accounts indicate the use of arms from vehicles and rocket fire from a helicopter belonging to this company. There are also concerns over the activities and approach of PMSC personnel, their convoys of armored vehicles and their conduct in traffic, in particular their use of lethal force. This particular incident was not the first of its kind, neither the first involving Blackwater. According to a congressional report on the behaviour of Xe/Blackwater in Iraq, Xe/Blackwater guards were found to have been involved in nearly 200 escalation-of-force incidents that involved the firing of shots since 2005. Despite the terms of the contracts which provided that the company could engage only in defensive use of force, the company reported that in over 80 per cent of the shooting incidents, its forces fired the first shots. In Najaf in April 2004 and on several other occasions, employees of this company took part in direct hostilities, as well as in May 2007, where another incident involving the same company reportedly occurred involving guards belonging to the company and forces belonging to the Iraqi Ministry of the Interior allegedly exchanged gunfire in a sector of Baghdad. Also in central Baghdad the shooting of employees of the PMSC, Unity Resources Group (URG), protecting a convoy, left two Armenian women, Genevia Antranick and Mary Awanis dead on 9 October 2007 when their car came too close to a protected convoy. The family of Genevia Antranick was offered no compensation and has begun court proceedings against URG in the United States. This company was also involved in the shooting of 72-year-old Australian Kays Juma. Professor Juma was shot in March 2006 as he approached an intersection being blockaded for a convoy URG was protecting. Professor Juma, a 25-year resident of Baghdad who drove through the city every day, allegedly sped up his vehicle as he approached the guards and did not heed warnings to stop, including hand signals, flares, warning shots into the body of his car and floodlights. The incident occurred at 10am. Two United States-based corporations, CACI and L-3 Services (formerly Titan Corporation), were involved in the torture of Iraqi detainees at Abu Ghraib. CACI and L-3 Services, contracted by the Government of the United States, were responsible for interrogation and translation services, respectively, at Abu Ghraib prison and other facilities in Iraq. Seventy two Iraqi citizens who were formerly detained at military prisons in Iraq, have sued L-3 Services, Inc. (“L-3”), a military private contractor which provided civilian translators for United States military forces in Iraq and Adel Nakhla, a former employee of L-3 who served as one of its translators there under the Alien Tort Statute. They allege having been tortured and physically and mentally abused during their detention and that they should be held liable in damages for their actions. The plaintiffs assert 20 causes of action, among which: torture; cruel, inhuman, or degrading treatment; assault and battery; intentional infliction of emotional distress. 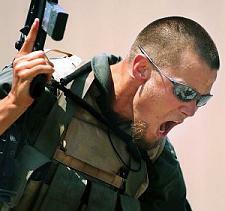 A number of reports indicate that private security guards have played central roles in some of the most sensitive activities of the Central Intelligence Agency (CIA) such as the arbitrary detention and clandestine raids against alleged insurgents in Iraq and Afghanistan and the involvement in CIA rendition flights as well as joint covert operations. Employees of PMSC would have been involved in the taking of detainees, from “pick up points” (such as Tuzla, Islamabad or Skopje) transporting them in rendition flights and delivering them to drop off points (such as Cairo, Rabat, Bucharest, Amman or Guantanamo) as well as in the construction, equipping and staffing of CIA’s “black sites”. Within this context, the American Civil Liberties Union has filed a lawsuit in May 2007 against Jeppesen DataPlan Inc. (a subsidiary company of Boeing) on behalf of five persons who were kidnapped by the CIA disappearing in overseas prisons kept by USA secret services. Jeppesen would have participated in the rendition by providing flight planning and logistical support. The five persons were tortured during their arbitrary detention. The 2009 annual report of DynCorp International refers to four lawsuits concerning the spraying of narcotic plant crops along the Colombian border adjacent to Ecuador on behalf of 3 Ecuadorian Providences and 3266 plaintiffs. From 1991, the United States Department of State contracted the private company DynCorp to supply services for this air-spraying program against narcotics in the Andean region. In accordance with the subscribed contract of 30 January 1998, DynCorp provides the essential logistics to the anti-drug Office of activities of Colombia, in conformity with three main objectives: eradication of cultivations of illicit drugs, training of the army and of personnel of the country, and dismantling of illicit drug laboratories and illicit drug-trafficking networks. 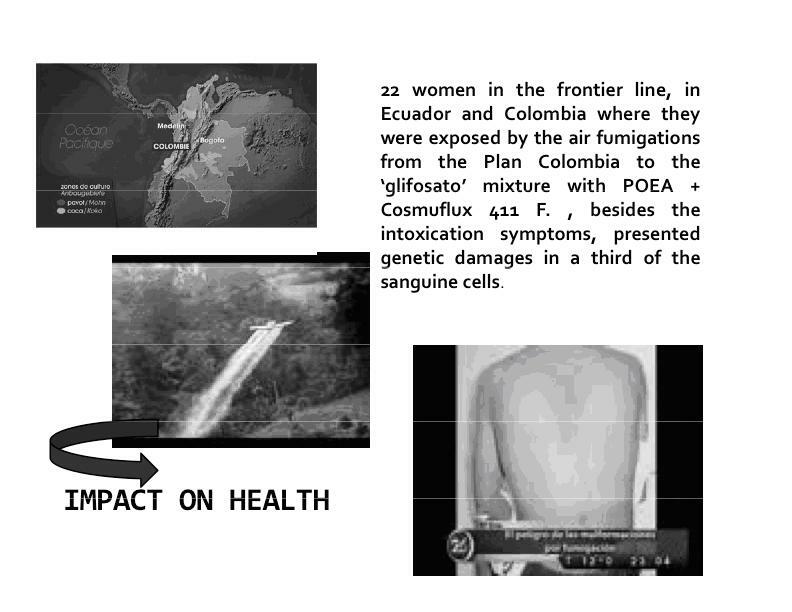 An NGO report indicated the consequences of the spraying carried out within the Plan Colombia had on persons living in the frontier region. One third of the 47 women in the study exposed to the spraying showed cells with some genetic damage. The study established the relationship of the air fumigations of the Plan Colombia with damages in the genetic material. The study demonstrates that when the population is subjected to fumigations “the risk of cellular damage can increase and that, once permanent, the cases of cancerous mutations and important embryonic alterations are increased that prompt among other possibilities the rise in abortions in the area. This example is particularly important given that Plan Colombia has served as the model for the arrangements that the United States would apply later to Iraq and Afghanistan. Plan Colombia provides immunity to the employees of the PMSC contracted (DynCorp) the same as Order 14 of the Coalition Provisional Authority did in Iraq. The 2004 attempted coup d’état, which was perpetrated in Equatorial Guinea is a clear example of the link between the phenomenon of mercenaries and PMSCs as a means of violating the sovereignty of States. In this particular case, the mercenaries involved were mostly former directors and personnel of Executive Outcomes, a PMSC that had become famous for its operations in Angola and Sierra Leone. The team of mercenaries also included security guards who were still employed by PMSCs as was the case of two employees of the company Meteoric Tactical Systems providing security to diplomats of Western Embassies in Baghdad-among which to the Ambassador of Switzerland. It also included a security guard who had previously worked for the PMSC “Steele Foundation” and had given protection to President Aristide of Haiti and conducted him to the plane who took him to exile. In 2005, 105 Chileans were providing/or undergoing military training in the former army base of Lepaterique in Honduras. 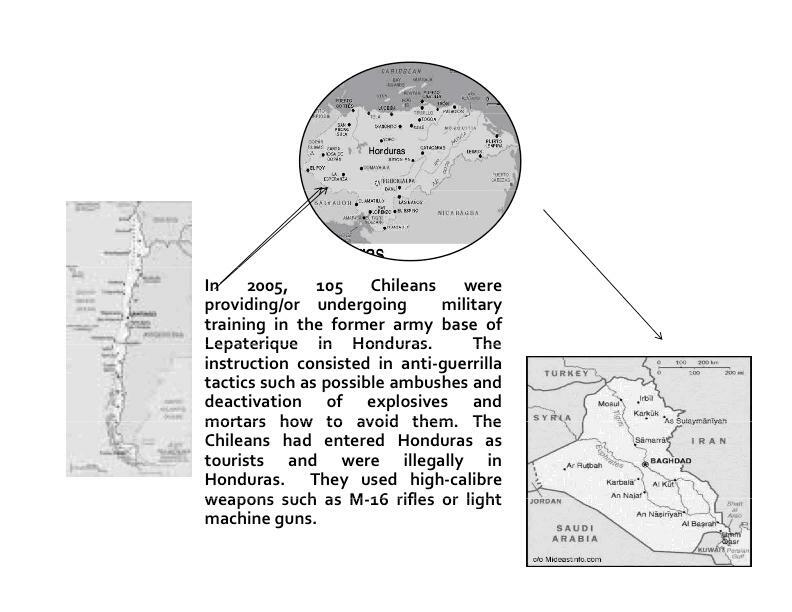 The instruction consisted in anti‐guerrilla tactics such as possible ambushes and deactivation of explosives and mortars how to avoid them. The Chileans had entered Honduras as tourists and were illegally in Honduras. They used high‐caliber weapons such as M‐16 rifles or light machine guns. They had been contracted by a subsidiary of Triple Canopy. They were part of a group, which included also 189 Hondurans recruited and trained in Honduras. Triple Canopy had been awarded a contract by the United States Department of State. The strong contingent left the country by air from San Pedro Sula, Honduras, in several groups with a stopover in Iceland. Then reached the Middle East and were smuggled into Iraq. The majority of the Chileans and Hondurans were engaged as security guards at fixed facilities in Iraq. They had been contracted by Your Solutions Honduras SRL, a local agent of Your Solutions Incorporated, registered in Illinois, United States of America, which in turn had been subcontracted by Triple Canopy, based in Chicago, United States of America. Some of the Chileans are presently working in Baghdad providing security to the Embassy of Australia under a contract by Unity Resources Group (URG). PMSC often put the contracted private guards in situations of danger and vulnerability, such as the ‘private contractors’ of Blackwater, killed in Fallujah in 2004 allegedly due to the lack of the necessary safety means that Blackwater was supposed to provide in order to carry out the mission. It should not be forgotten that this incident changed dramatically the course of the war and the occupation by the United States in Iraq. It may be considered as the turning point in the occupation of Iraq. This led to an abortive US operation to recapture control of the city and a successful recapture operation in the city in November 2004, called Operation Phantom Fury, which resulted in the death of over 1,350 insurgent fighters. Approximately 95 America troops were killed, and 560 wounded. The U.S. military first denied that it has use white phosphorus as an anti-personnel weapon in Fallujah, but later retracted that denial, and admitted to using the incendiary in the city as an offensive weapon. Reports following the events of November 2004 have alleged war crimes, and a massacre by U.S. personnel, including indiscriminate violence against civilians and children.http://en.wikipedia.org/wiki/Fallujah – cite_note-17 This point of view is presented in the 2005 documentary film, “Fallujah, the Hidden Massacre”. In 2010, the International Journal of Environmental Research and Public Health, a leading medical journal, published a study, which shows that the rates of cancer, infant mortality and leukemia exceed those reported in Hiroshima and Nagasaki. The over 300 000 classified military documents made public by Wikileaks show that the “Use of Contractors Added to War’s Chaos in Iraq”, as has been widely reported by the international media recently. The United States has relied and continues to rely heavily on private military and security contractors in conducting its military operations. The United States used private security contractors to conduct narcotics intervention operations in Colombia in the 1990s and recently signed a supplemental agreement that authorizes it to deploy troops and contractors in seven Colombian military bases. During the conflict in the Balkans, the United States used a private security contractor to train Croat troops to conduct operations against Serbian troops. Nowadays, it is in the context of its operations in Iraq and Afghanistan in particular that the State is massively contracting out security functions to private firms. In 2009, the Department of Defense employed 218,000 private contractors (all types) while there were 195,000 uniformed personnel. According to the figures, about 8 per cent of these contractors are armed security contractors, i.e. about 20,000 armed guards. If one includes other theatres of operations, the figure rises to 242,657, with 54,387 United States citizens, 94,260 third country nationals and 94,010 host-country nationals. The State Department relies on about 2,000 private security contractors to provide United States personnel and facilities with personal protective and guard services in Afghanistan, Iraq, Israel and Pakistan, and aviation services in Iraq. The contracts for protective services were awarded in 2005 to three PMSCs, namely, Triple Canopy, DynCorp International and the U.S. Training Center, part of the Xe (then Blackwater) group of companies. These three companies still hold the State Department protective services contracts today. The information accessible to the public on the scope and type of contracts between the Government of the United States and PMSCs is scarce and opaque. The lack of transparency is particularly significant when companies subcontract to others. Often, the contracts with PMSCs are not disclosed to the public despite extensive freedom of information rules in the United States, either because they contain confidential commercial information or on the argument that non-disclosure is in the interest of national defense or foreign policy. The situation is particularly opaque when United States intelligence agencies contract PMSCs. Despite the fact of their involvement in grave human rights violations, not a single PMSC or employee of these companies has been sanctioned. In the course of litigation, several recurring legal arguments have been used in the defense of PMSCs and their personnel, including the Government contractor defense, the political question doctrine and derivative immunity arguments. PMSCs are using the Government contractor defense to argue that they were operating under the exclusive control of the Government of the United States when the alleged acts were committed and therefore cannot be held liable for their actions. It looks as if when the acts are committed by agents of the government they are considered human rights violations but when these same acts are perpetrated by PMSC it is “business as usual”. The human rights violation perpetrated by private military and security companies are indications of the threat posed to the foundations of democracy itself by the privatization of inherently public functions such as the monopoly of the legitimate use of force. In this connection I cannot help but to refer to the final speech of President Eisenhower. In 1961, President Eisenhower warned the American public opinion against the growing danger of a military industrial complex stating: “(…) we must guard against the acquisition of unwarranted influence, whether sought or unsought, by the military industrial complex. The potential for the disastrous rise of misplaced power exists and will persist. We must never let the weight of this combination endanger our liberties or democratic processes. We should take nothing for granted. Only an alert and knowledgeable citizenry can compel the proper meshing of the huge industrial and military machinery of defence with our peaceful methods and goals, so that security and liberty may prosper together”. Rumsfeld should have said the shift from the Pentagon’s resources from bureaucracy to the private sector. Indeed, that shift had been accelerated by the Bush Administration: the number of persons employed by contract which had been outsourced (privatized) by the Pentagon was already four times more than at the Department of Defense. It is not anymore a military industrial complex but as Noam Chomsky has indicated « it’s just the industrial system operating under one or another pretext”. The articles of the Washington Post “Top Secret America: A hidden world, growing beyond control”, by Dana Priest and William M. Arkin (19 July 2010) show the extent that “The top-secret world the government created in response to the terrorist attacks of Sept. 11, 2001, has become so large, so unwieldy and so secretive that no one knows how much money it costs, how many people it employs, how many programs exist within it or exactly how many agencies do the same work”. The investigation’s findings include that some 1,271 government organizations and 1,931 private companies work on programs related to counterterrorism, homeland security and intelligence in about 10,000 locations across the United States; and that an estimated 854,000 people, nearly 1.5 times as many people as live in Washington, D.C., hold top-secret security clearances. A number of private military and security companies are among the security and intelligence agencies mentioned in the report of the Washington Post. The Working Group received information from several sources that up to 70 per cent of the budget of United States intelligence is spent on contractors. These contracts are classified and very little information is available to the public on the nature of the activities carried out by these contractors. The privatization of war has created a structural dynamic, which responds to a commercial logic of the industry. A short look at the careers of the current managers of BAE Systems, as well as on their address-books, confirms we are not any longer dealing with a normal corporation, but with a cartel uniting high tech weaponry (BAE Systems, United Defence Industries, Lockheed Martin), with speculative financiers (Lazard Frères, Goldman Sachs, Deutsche Bank), together with raw material cartels (British Petroleum, Shell Oil) with on the ground, private military and security companies. The majority of the private military and security companies has been created or are managed by former militaries or ex-policemen for whom it is big business. Just to give an example MPRI (Military Professional Resources Incorporation) was created by four former generals of the United States Army when they were due for retirement. The same is true for Blackwater and its affiliate companies or subsidiaries, which employ former directors of the C.I.A.. Social Scientists refer to this phenomenon as the Rotating Door Syndrome. “Without contractors: (1) the military engagement would have had to be smaller–a strategically problematic alternative; (2) the United States would have had to deploy its finite number of active personnel for even longer tours of duty -a politically dicey and short-sighted option; (3) the United States would have had to consider a civilian draft or boost retention and recruitment by raising military pay significantly–two politically untenable options; or (4) the need for greater commitments from other nations would have arisen and with it, the United States would have had to make more concessions to build and sustain a truly multinational effort. Thus, the tangible differences in the type of war waged, the effect on military personnel, and the need for coalition partners are greatly magnified when the government has the option to supplement its troops with contractors”. The military cannot do without them. There are more contractors over all than actual members of the military serving in the worsening war in Afghanistan. Conclusion I: The proliferation of private security personnel in Afghanistan is inconsistent with the counterinsurgency strategy. In May 2010 the U.S. Central Command’s Armed Contractor Oversight Directorate reported that there were more than 26,000 private security contractor personnel operating in Afghanistan. Many of those private security personnel are associated with armed groups that operate outside government control. Conclusion 2: Afghan warlords and strongmen operating as force providers to private security contractors have acted against U.S. and Afghan government interests. Warlords and strongmen associated with U.S.-funded security contractors have been linked to anti Coalition activities, murder, bribery, and kidnapping. The Committee’s examination of the U.S. funded security contract with ArmorGroup at Shindand Airbase in Afghanistan revealed that ArmorGroup relied on a series of warlords to provide armed men to act as security, guards at the Airbase. Because of their impact in the enjoyment of human rights the Working Group on mercenaries in its 2010 reports to the UN Human Rights Council and General Assembly has recommended a legally binding instrument regulating and monitoring their activities at the national and international level. The motion to create an open ended intergovernmental working group has been the object of lengthy negotiations, in the Human Rights Council, led by South Africa in order to accommodate the concerns of the Western Group, but primarily those of the United States and the United Kingdom and of a lot a pressure exerted in the capitals of African countries supporting the draft resolution. The text of the resolution was weakened in order to pass the resolution by consensus. But even so the position of the Western States has been a “fin de non recevoir”. The resolution was adopted by a majority of 32 in favour, 12 against and 3 abstentions. Among the supporters of this initiative are four out of the five members of BRICS (Brazil, Russia, China and South Africa) in addition to the African Group, the Organization of the Islamic Conference and the Arab Group. The adoption of this resolution opens an interesting process in the UN Human Rights Council where civil society can participate in the elaboration of an international framework on the regulation, monitoring and oversight of the activities of private military and security companies. The new open ended intergovernmental working group will be the forum for all stakeholders to receive inputs, not only the draft text of a possible convention and the elements elaborated by the UN Working Group on mercenaries but also of other initiatives such as the proposal submitted to the Parliamentary Assembly of the Council of Europe, the Montreux Document and the international code of conduct being elaborated under the Swiss Initiative. However, the negative vote of the delegations of the Western Group indicates that the interests of the new staggering security industry – its annual market revenue is estimated to be over USD one hundred billion – have been quite well defended as was the case in a number of other occasions. It also shows that Western governments will be absent from the start in a full in-depth discussion of the issues raised by the activities of PMSC. We urge all States to support the process initiated by the Council by designating their representatives to the new open-ended intergovernmental working group, which will hold its first session in 2011, and to continue a process of discussions regarding a legally binding instrument. The participation of the UK and USA main exporters of these activities (it is estimated at 70% the industry of security in these two countries) as well as other Western countries where the new industry is expanding is of particular importance. respond to pending communications from the Working Group. The United Nations Human Rights Council, under the Universal Periodic Review, initiated a review in November 2010 in Geneva, focussing on the human rights record of the United States. 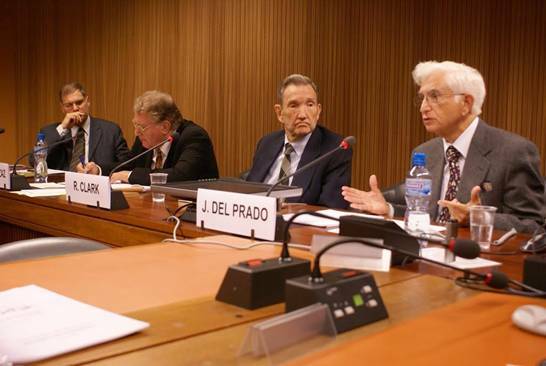 The above article is an edited version of the presentation given by Jose L. Gomez del Prado in Geneva on 3 November 2010 at a parallel meeting at the UN Palais des Nations on that occasion. Blackwater Worldwide abandoned its tarnished brand name in order to shake its reputation battered by its criticized work in Iraq, renaming its family of two-dozen businesses under the name Xe’, see Mike Baker, ‘Blackwater dumps tarnished brand name’, AP News Break, 13 February 2009. URG, an Australian private military and security company, uses a number of ex military Chileans to provide security to the Australian Embassy in Baghdad. Recently one of those “private guards” shot himself, ABC News, reported by La Tercera, Chile, 16 September 2010. J.Mendes & S Mitchell, “Who is Unity Resources Group?”, ABC News Australia, 16 September 2010. Case 8:08-cv-01696-PJM, Document 103, Filed 07/29/10. Defendants have filed Motions to Dismiss on a number of grounds. They argue, among others, that the suit must be dismissed in its entirety because they are immune under the laws of war, because the suit raises non-justiciable political questions, and because they possess derivative sovereign immunity. They seek dismissal of the state law claims on the basis of government contractor immunity, premised on the notion that Plaintiffs cannot proceed on state law claims, which arise out of combatant activities of the military. The United States District Court for the district of Maryland Greenbelt Division has decided to proceed with the case against L-3 Services, Inc. It has not accepted the motions to dismiss allowing the case to go forward. Mission to the United States of America, Report of the Working Group on the use of mercenaries, United Nations document, A/HRC/15/25/Add.3, paragraphs 22. James Risen and Mark Mazzetti, “Blackwater guards tied to secret C.I.A. raids ”, New York Times, 10 December 2009. Adam Ciralsky, “Tycoon, contractor, soldier, spy”, Vanity Fair, January 2010. See also Claim No. HQ08X02800 in the High Court of Justice, Queen’s Bench Division, Binyam Mohamed v. Jeppesen UK Ltd, report of James Gavin Simpson, 26 May 2009. ACLU Press Release, UN Report Underscores Lack of Accountability and Oversight for Military and Security Contractors, New York, 14 September 2010. A number of the persons involved in the attempted coup were arrested in Zimbabwe, other in Equatorial Guinea itself the place where the coup was intended to take place to overthrow the government and put another in its place in order to get the rich resources in oil. In 2004 and 2008 the trials took place in Equatorial Guinea of those arrested in connection with this coup attempt, including of the British citizen Simon Mann and the South African Nick du Toit. The President of Equatorial Guinea pardoned all foreigners linked to this coup attempt in November 2009 by. A number of reports indicated that trials failed to comply with international human rights standards and that some of the accused had been subjected to torture and ill-treatment. The government of Equatorial Guinea has three ongoing trials in the United Kingdom, Spain and Lebanon against the persons who were behind the attempted coup. Report of the Working Group on the use of mercenaries, Mission to Honduras, United Nations document A/HRC/4/42/Add.1. Among which General Carl E. Vuono, Chief of the Army during the Gulf War and the invasion of Panama; General Crosbie E. Saint, former Commander in Chief of the USA Army in Europe and General Ron Griffith. The President of MPRI is General Bantant J. Craddock.